I was saddened to hear the news that Koos Van Den Akker passed away on Tuesday, February 3rd, at the age of 75 following a brief illness. He was a true artist and a unique, one of a kind original. He had a very specific point of view and design aesthetic, and always stood his ground, never wavered, or compromised. Puck Meunier, owner of his company, told me that three weeks ago, he was still sewing. 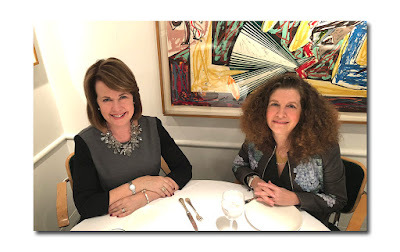 Ms. Meunier, who was at the Koos Van Den Akker Madison Avenue store (1263 Madison Avenue at 91st street, 212 722 9853), also confirmed that everything will continue on as it has, with the group of designers that had worked with him, and the rich archives they have at their disposal. I had known Koos for many years. I first met him when I was his editor at Harper’s Bazaar, (he had a wholesale showroom on 7th avenue in the 1970’s and his designs were sold to Saks, Bonwit’s, Bloomingdales, Marshall Fields, etc.) The last time I saw him was last January at the opening of “Fashion and Folk Art”, an exhibition mounted by the American Folk Art Museum. He was one of 13 established and emerging designers invited to create an original ensemble inspired by a selection chosen from the museum’s permanent collection. Born in The Hague, Netherlands in 1939, he taught himself to sew, and his innate craftiness was illustrated by his very first project: a dress he made for his sister using a white bed sheet which he embroidered with fake pearls unstrung from his mother’s necklace. He was so precocious, he enrolled in the Royal Academy of Art at the age of 15 (the age requirement was 18). After leaving school at the age of 18 to enlist in the army, he went off to Paris where he did window displays for Galleries Lafayette. He then enrolled in, L’Ecole Guerre Lavinge, and as fate would have it, it was located in the same building as the Christian Dior workrooms. Each year, Dior offers the most “promising” students an apprenticeship, and in 1963, he was selected. 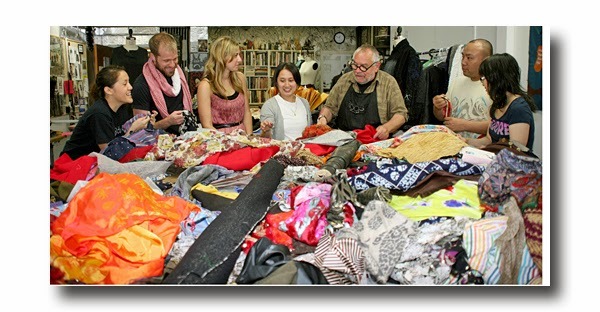 For two years, he honed his skills and learned about making beautiful clothes. But while the house of Dior was all about precision cut, fit, shape, and silhouette, Koos was not at all interested in the way a design fell on the body. He was quoted as saying “start with the fabric. Silhouettes come later”. For him, it was all about the fabric. And not just one fabric; but a collage of luxurious fabrics (tweeds, metallic, fur, sequins, quilted fabric, leather, cotton). The more fabrics, colors, and textures, the better. 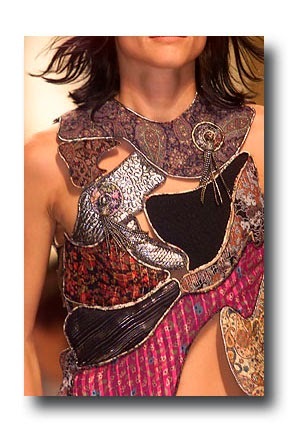 The resulting designs, which wisely made use of the simplest of shapes, were the definition of wearable art, and attracted those who were seeking something beautiful, artisanal, unique, and guaranteed to be one of a kind. 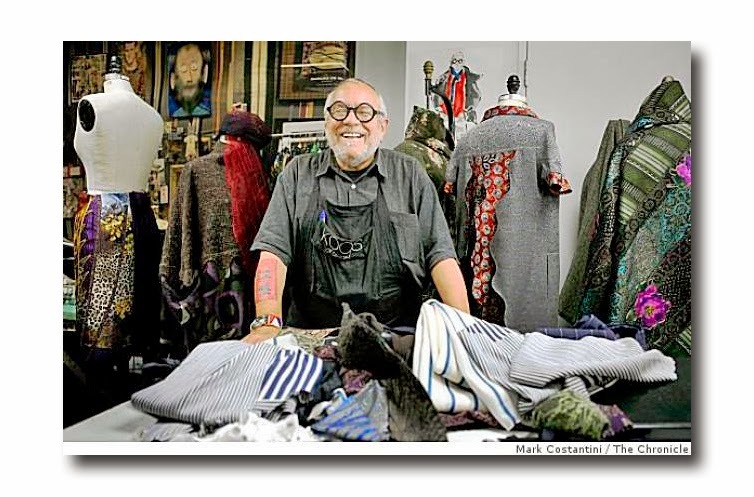 When Koos’s colorful wildly collaged sweaters caught the attention of Bill Cosby (and became his signature uniform on “The Cosby Show”), it put him on the map. Other loyal customers include Cher, Harry Belafonte, Stevie Wonder, Barbara Walters, Isabella Rosselini, and Elizabeth Taylor (talk about a varied group). And, thanks to my artistic sensibility, they have certainly attracted me. On a personal note, I own two Koos coats and one in particular, is one of the absolute all-time favorite pieces in my (overflowing) wardrobe. Purchased at a vintage show in New York about 10 years ago, it’s an ankle length, fabulously heavy, voluminously tent shaped coat (which needs almost a room of its own LOL). It’s not not only the warmest thing I own (perfect for right now), but a true work of art, covered in the most fabulous collage of florals, tweeds, plaids, quilted appliques, all in in muted colors. I have nothing else like it and haven’t seen another quite like it. It is so amazing, that whenever I wear it, people (men and women) invariably stop me on the street to admire and inquire about it. 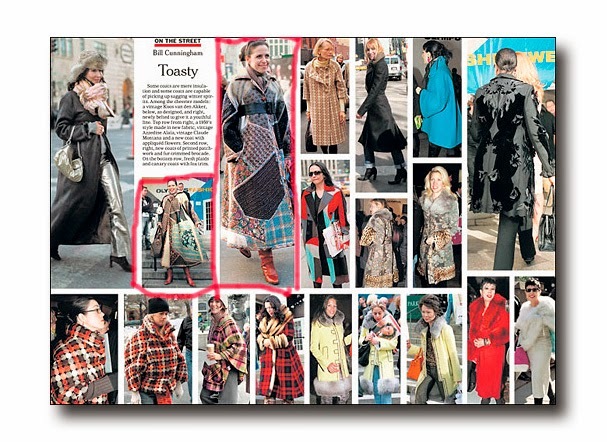 Unsurprisingly, it happened to catch the eye of Bill Cunningham during New York Fashion Week in March, 2005, and he included two versions of it (belted and unbelted) in his On the Street column, “Toasty”, March 6, 2005. 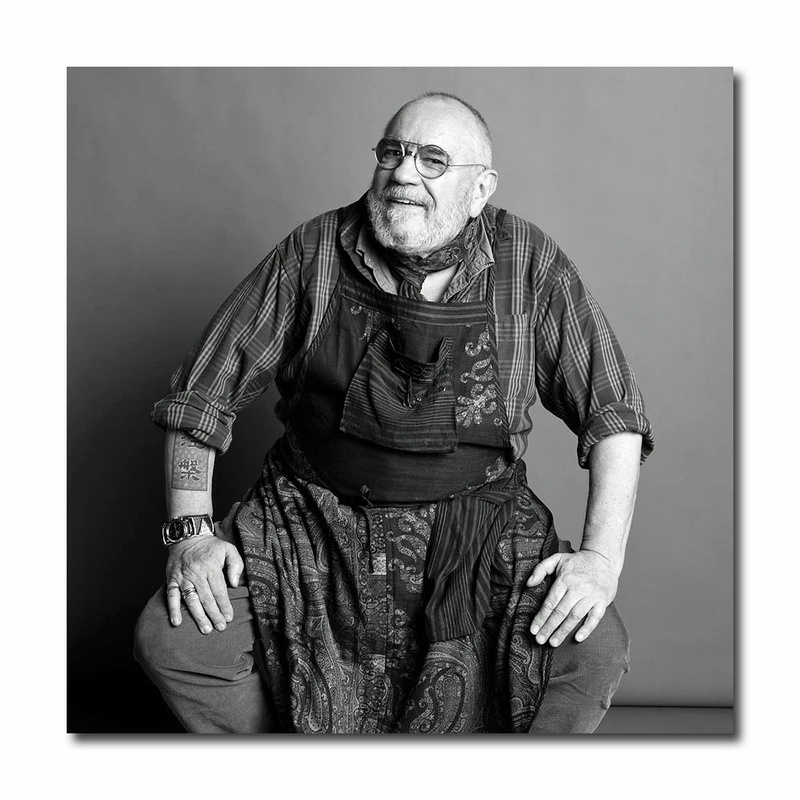 While Koos’s work did not reference anyone but himself, he was undeniably an influence on other highly influential and revered designers, including Geoffrey Beene, Nicolas Guesquiere for Balenciaga (his collaged themed Spring 2002 collection), and Marc Jacobs (for his Fall 2006 line). The longstanding CFDA member was a groundbreaker and a pioneer in many ways, not the least of which was his very successful collaboration in 1998 with QVC. 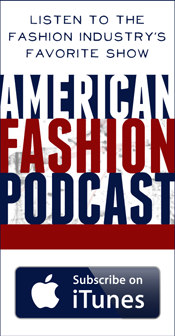 He was given many awards, honors, and accolades throughout his life, yet he was unfazed by the hype and cult of celebrity that surrounds fashion, (and its designers), and he always remained honest, outspoken, down to hearth, grounded, humble. He is quoted as saying, “I think of myself as very basic. I am a craftsperson and I sew like that. I sew beautiful clothes. I am nothing more than a worker sitting behind a sewing machine. That's where I feel most comfortable, that's where I am the best. That's what I do best and it's very basic."